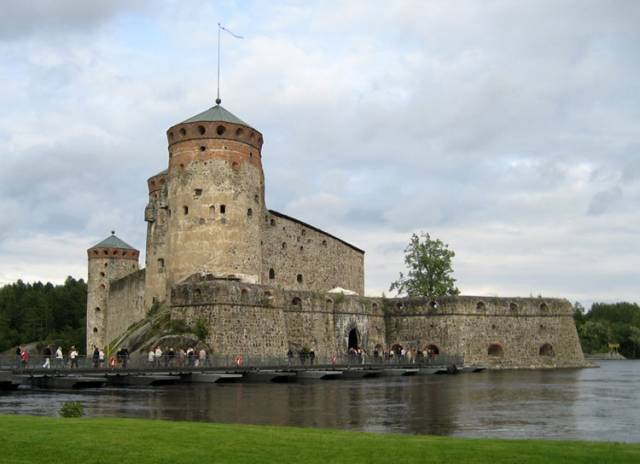 Castle in Savonlinna, Finland. Fortress of St. Olav (Olavinlinna, Olofsborg) is the main attraction of the Savonlinna city. The fortress is located on a small island on Lake Saimaa. Construction of the fortress began in 1475. Construction of the main part of the fortress was completed in 1483. The fortress was built by order of the Swedish regent Eric Tott. Olavinlinna is the northernmost medieval stone castle. The distance to the castle from St. Petersburg is approximately 350 kilometers, distance from Helsinki is about 330 kilometers. Since 1912 in the summer in the castle is annually held popular opera festival. Some of the rooms in a medieval castle can be rented for private events. In the International Museum Day entrance to the castle is free. See also the photos of a medieval castle in Vyborg city.